Iman Ali is Well repute and top actress of Pakistan film and drama industry.She is top model and often top stopper of the ramp.She have attractive features and sizzling and appealing Beauty.This time she is giving shoots for for Damas Art of Beauty GENERO ITALY. 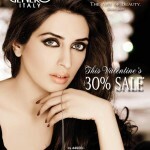 This entry was posted in Make Up and tagged Damas, GENERO ITALY, Iman Ali, Iman Ali Pics, Iman Ali Shoot by Style Cry. Bookmark the permalink.